When I was around 17 years old, I acquired electronic habilities during my free time. Music also being one of my hobbies, I decided to use my electronic knowledge to build an audio amplifier. While my amplifier is not the most powerful that exists, it outputs a good quality of sound. It also has succesfully passed the "party test". This means it has played as loud as possible without (intolerable) distortion for many hours hours, in a 3-4 ohms load. During the initial research I did before building, I discovered the tda7294 IC from SGS-Thomson. It is an 100 watt operational amplifier. My design uses this amplifier. 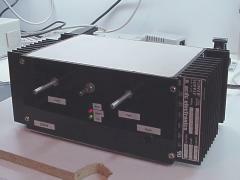 2 channels, each one able to deliver 100 watts(Begin to have unacceptable distortion at more than 70watts). 3 stereo input, selectable with a rotary switch on the front panel. 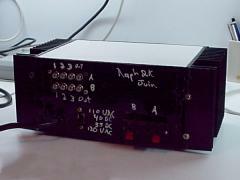 1 output, to send the selected signal to other equipment. 110 or 130 volts ac input. Fanless operation. (and thus, silent). If you would like to build one, find the TDA7294 datasheet. (Go to www.st.com and search for part number tda7294.) The datasheet contains the specifications, schematics and pcb artwork. Less component, so less expensive to build.. The PCB was simpler, which was very important since I was forced to hand draw them. Power supply less complicated, because you dont need 4 different voltages. The high efficiency mode is just a way to generate less heat. I did not care about that, because I had big heat sinks. I used a 110 volts to 50 volts ac transforer with a center tap. (this means +50 volts and -50volts). Next, I rectify the current with a diode bridge(big enough for 8A), and I filter with 2 big capacitors of 10000uf each. The tda7294 is available at many places. I bought mine at Newark Electronics. The transformer and the heat sinks comes from a local electronic components reseller. The front panel. 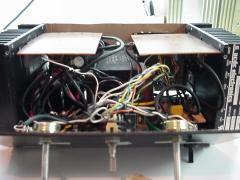 Here we can see the back of the amplifier. As I said in the spec section, there are 3 audio input and one output. There is also a switch to choose the ac voltage input (110 or 130 volts). 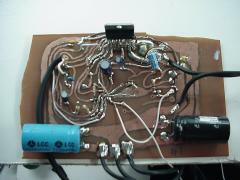 Back then, when I built this amplifier, I had very little money, thus the case is build from very various materials. The cover is made with wood, the bottom is an aluminium sheet (1/8"), the back has been cut in the cover of a VCR, and the front is made of black plexiglass that comes from the door of a refrigerator. 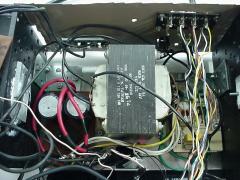 Here is a first internal view of the amplifier. The 2 amplifier PCBs are screwed to the heat sink on both sides. 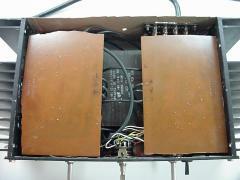 The transformer is in the middle, and on both sides of it, the power supply components. y a le transformateur et sur les deux cotés les composantes du power supply. Here is the amplifier board of one of the two channels. As you can see, the TDA7294 requires very few components. A closer look to the power supply. It has 3 main parts. The ac filter is on the right, the transformer in the middle, and the diode bridge and capacitors are on the left.